Pierre-Auguste Renoir (1841–1919), Misia Sert with a Lap Dog (Young Woman with a Lap-Dog) (c 1906), oil on canvas, 92.5 x 73.5 cm, Barnes Foundation, Philadelphia, PA. Wikimedia Commons. The Arts depend on a complex web of people other than artists themselves. For a painter, it starts with the paint manufacturer and materials suppliers, and extends right through to galleries, dealers and copyright agencies. Somewhere in the middle is the patron, often a close friend, who has the money to make it all happen. Between about 1895 and the late 1930s, one of the most important patrons in France was a Polish woman, born Maria Zofia Zenajda Godebska in 1872, but subsequently known as Misia Natanson, Edwards, or Sert. Her father was Cyprian Godebski, a major sculptor who was a professor at the Imperial Academy in Saint Petersburg. Misia’s mother died shortly after the girl’s birth, and Misia was sent to her grandparents in Brussels. This took her from sculpture to music, as those grandparents had musical circles which included Franz Liszt. She was brought up as a pianist, and when her father moved her to Paris, she studied under Gabriel Fauré. Misia married for the first time at the age of twenty-one, to her cousin Thadée Natanson, who had socialist ideals and lived in artistic circles. The Natansons entertained Marcel Proust, Stéphane Mallarmé, André Gide, and Claude Debussy. But they were closest to their painter friends: Claude Monet, Pierre-Auguste Renoir, Odilon Redon, Paul Signac, and Henri de Toulouse-Lautrec. Henri de Toulouse-Lautrec (1864–1901), Portrait of Misia Natanson (Sert) (1895), further details not known. Wikimedia Commons. 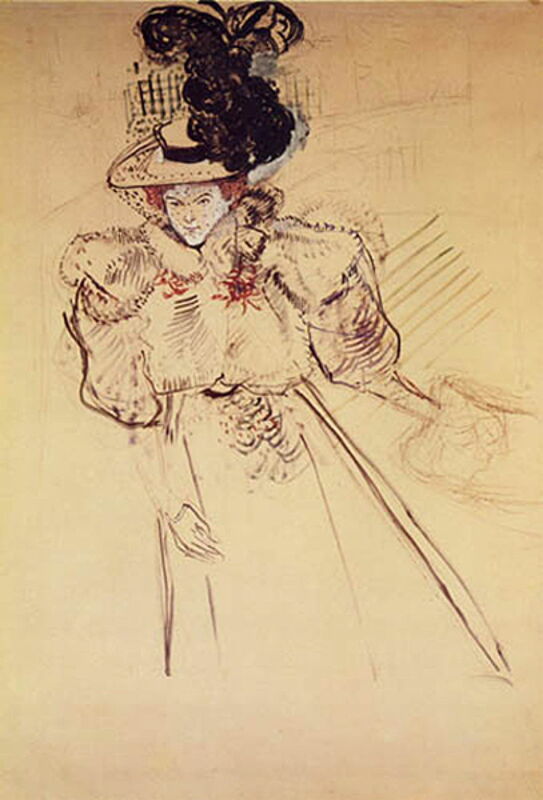 It was probably Toulouse-Lautrec who first started to draw and paint Misia, as in this Portrait of Misia Natanson of 1895. Henri de Toulouse-Lautrec (1864–1901), Poster for La revue blanche (1895), further details not known. Wikimedia Commons. 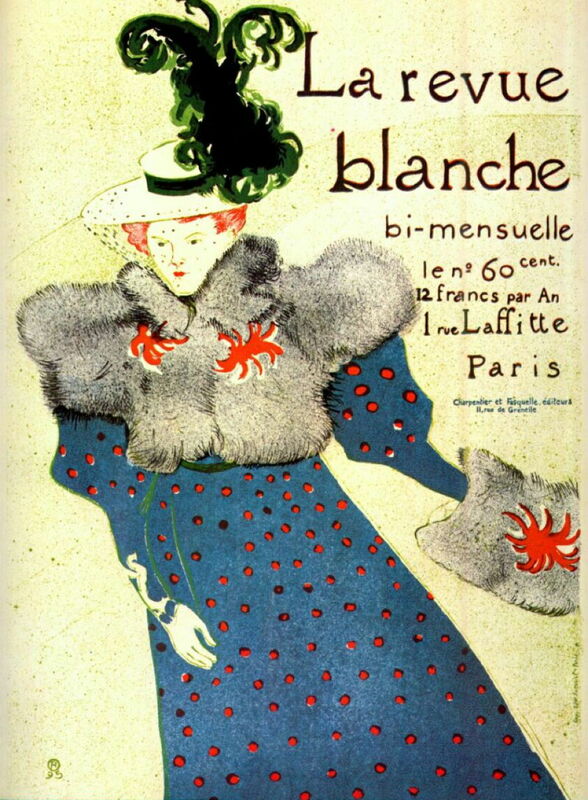 He turned that into his Poster for “La revue blanche” (1895), the arts magazine co-founded in 1889 by Misia’s husband, which was the platform which promoted the Nabis, including Pierre Bonnard. Henri de Toulouse-Lautrec (1864–1901), Misia Natanson (1897), media and dimensions not known, Musée des Beaux-Arts, Berne, Switzerland. Image by J Frey, via Wikimedia Commons. 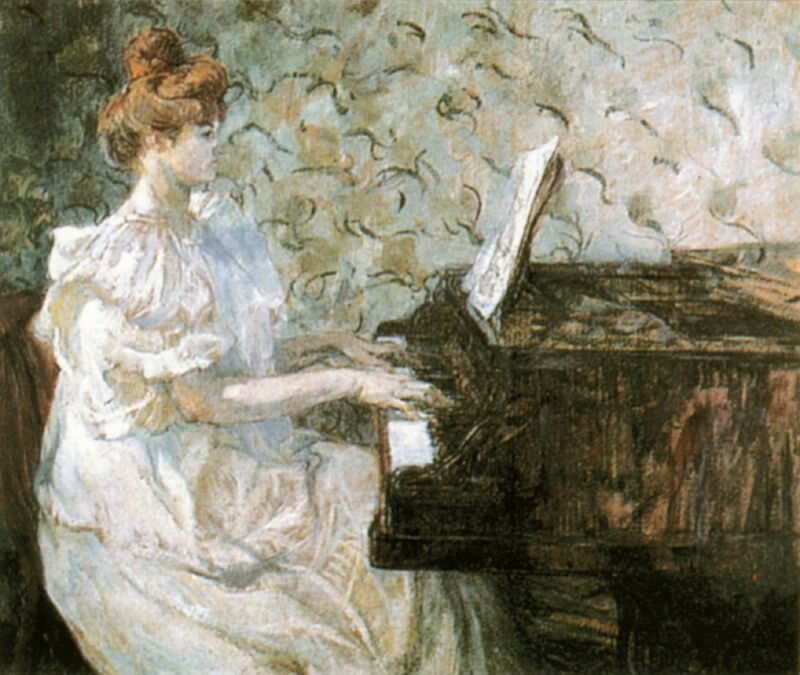 Toulouse-Lautrec later painted Misia Natanson (1897) playing the piano. The Nabis themselves painted Misia’s portraits, not just as their main patron, but in informal settings, as more of a friend and muse. Édouard Vuillard (1868–1940), Vallotton at the Natansons (1897), further details not known. Wikimedia Commons. 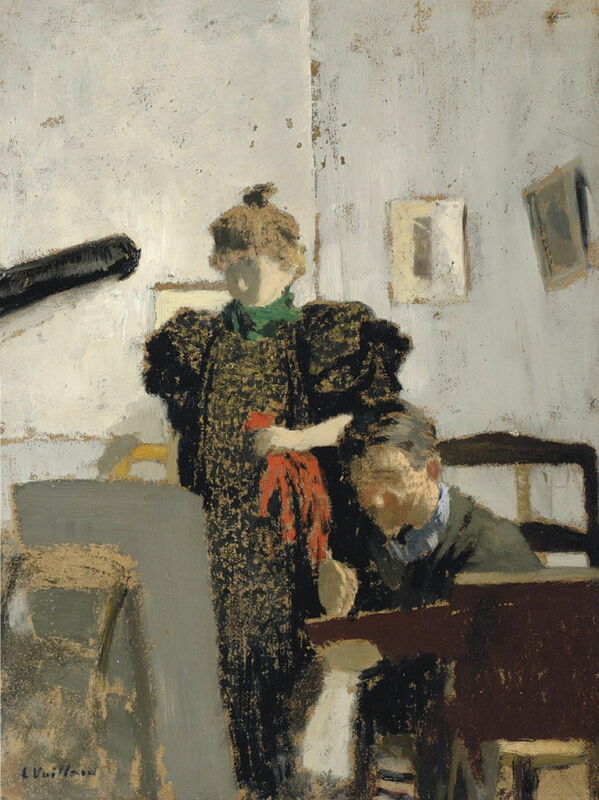 Édouard Vuillard’s Vallotton at the Natansons shows Misia watching Félix Vallotton painting in 1897, at the Natanson’s home. 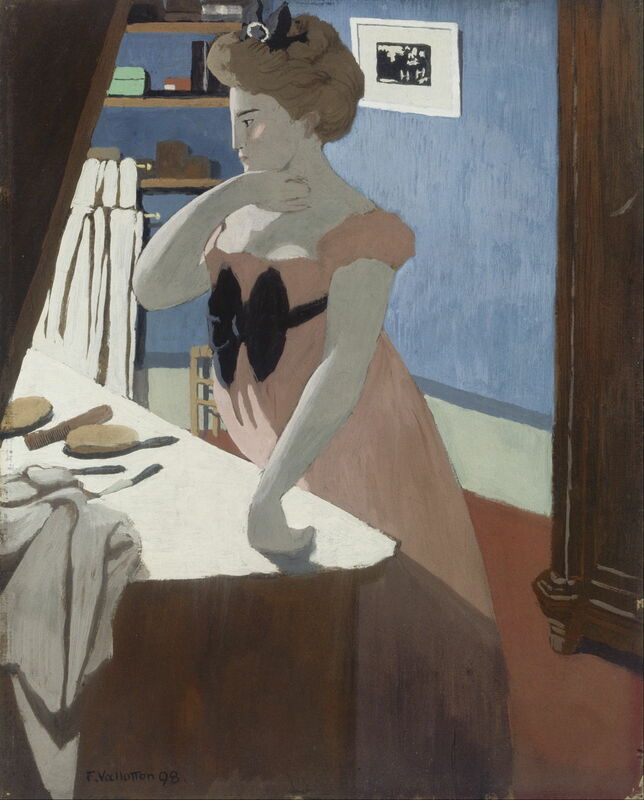 Félix Vallotton affords us a glimpse into her private life, in his Misia at Her Dressing Table (1898). Pierre Bonnard (1867-1947), Misia Natanson at Breakfast (c 1899), oil on wood, 32 x 41 cm, Private collection. The Athenaeum. 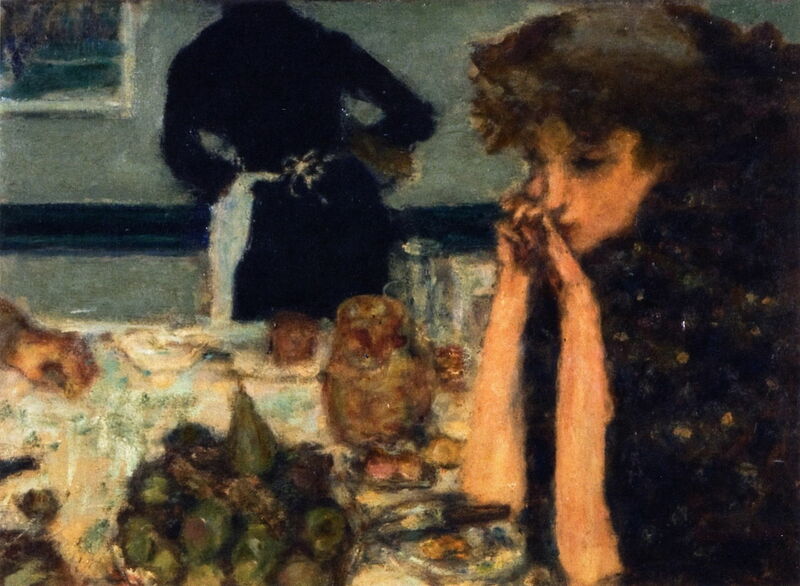 In his turn, Pierre Bonnard painted Misia Natanson at Breakfast in about 1899, with one of the family’s maids at work in the background. 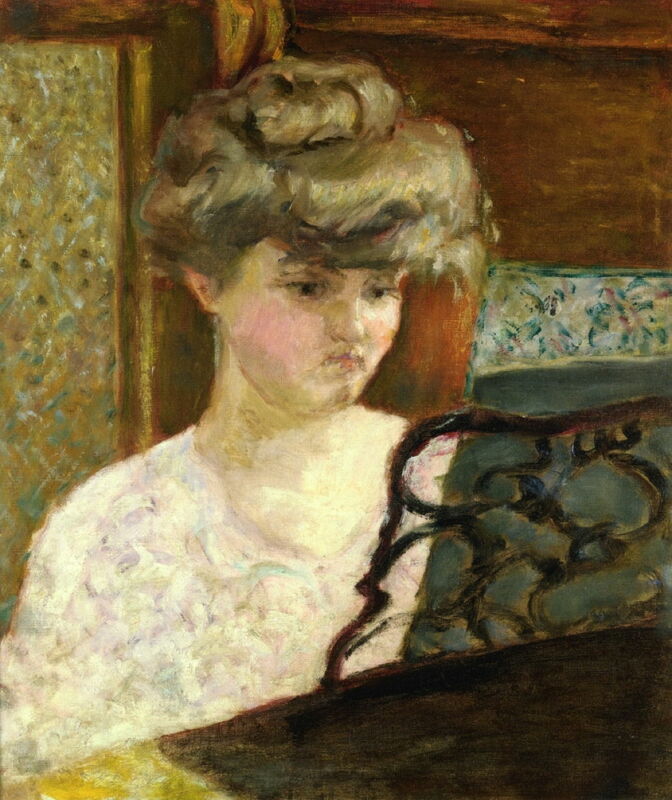 Bonnard’s Misia at the Piano from about 1902 shows Misia doing what she loved most. At this time, Thadée Natanson needed more capital to support his publishing and other activities. He found a source in Alfred Edwards, a publishing magnate who had founded and published the major newspaper in Paris at the time, Le Matin. Unfortunately, Edwards and Misia fell in love, and Misia became Edwards’ mistress in 1903. As Natanson wanted his capital, so Edwards wanted Misia, and that became a condition of the deal. Pierre-Auguste Renoir (1841-1919), Misia Sert (1904), oil on canvas, 92.1 x 73 cm, The National Gallery (Bought, 1960), London. Courtesy of and © The National Gallery, London. 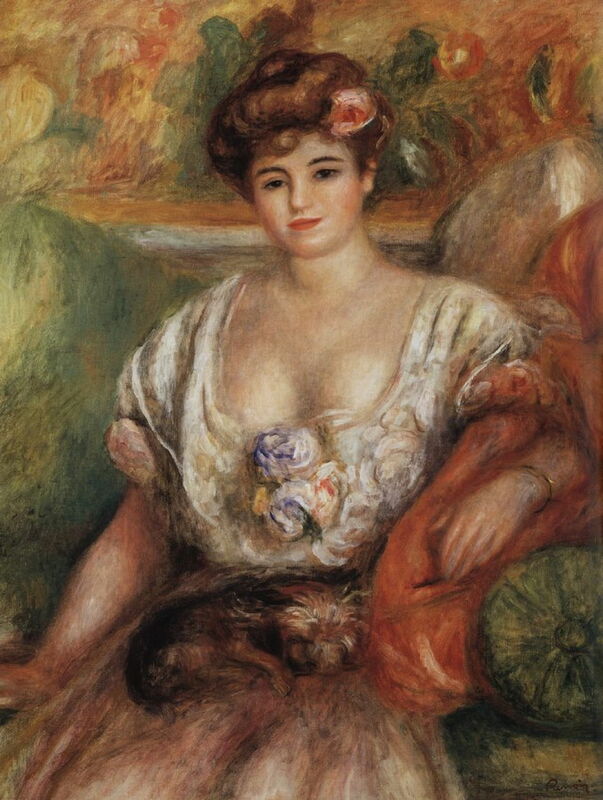 Renoir painted this and the next portrait of Misia Sert while this was being settled, in 1904. Of the two, this is the better-known, as it hangs in the National Gallery in London. I can’t help feeling that she is unhappy here. 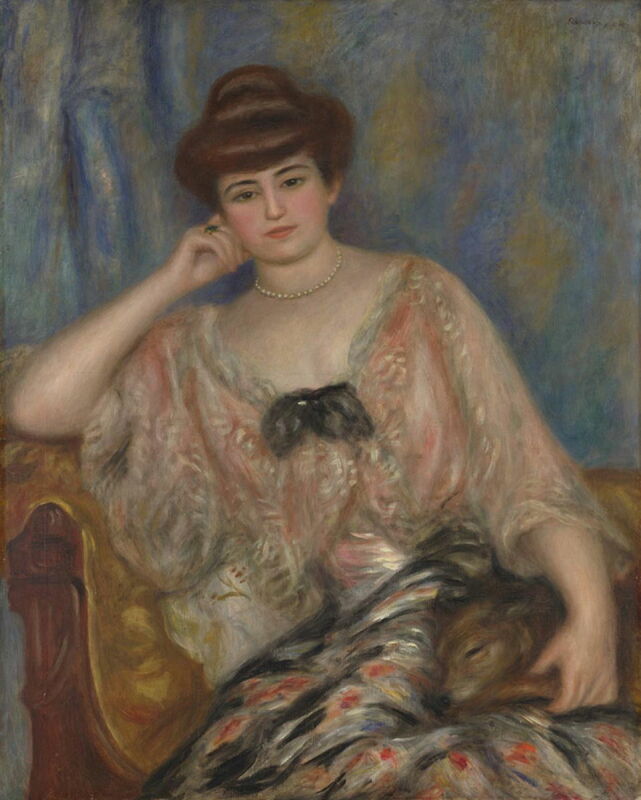 Pierre-Auguste Renoir (1841–1919), Portrait of Misia Sert (1904), oil on canvas, 55.5 × 66.5 cm, Tel Aviv Museum of Art, Tel Aviv, Israel. Wikimedia Commons. 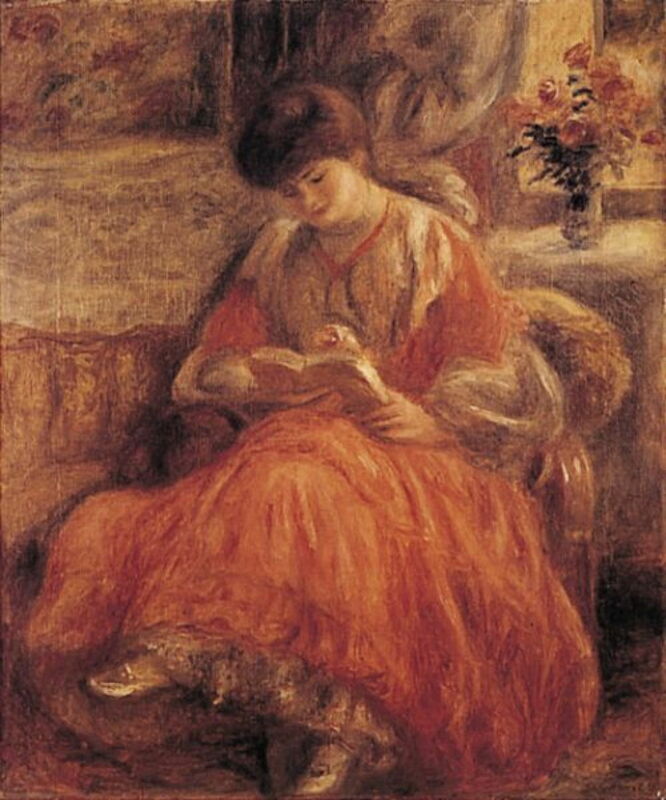 In this second of Renoir’s portraits of Misia from 1904, now in Tel Aviv, she is as sumptuously dressed, but her head is buried in a book. Pierre Bonnard (1867-1947), Misia Natanson and Her Dog (c 1904), oil on panel, 46 x 37 cm, Private collection. The Athenaeum. Pierre Bonnard sees a completely different figure, though. In Misia Natanson and Her Dog from about 1904, she is out in the country with her dog, wearing an ornate white lace hat – more like a character from a nursery rhyme than the mistress of a newspaper magnate. The following year, Misia married Edwards, and her circle of artists and composers benefited from new patronage with even deeper pockets. Misia and her husband had a yacht – by which I mean a large, crewed vessel, not a dinky little dinghy. In the summer of 1905, they took Bonnard, Maurice Ravel, and others on the yacht’s maiden cruise to Belgium, the Netherlands, and Germany. 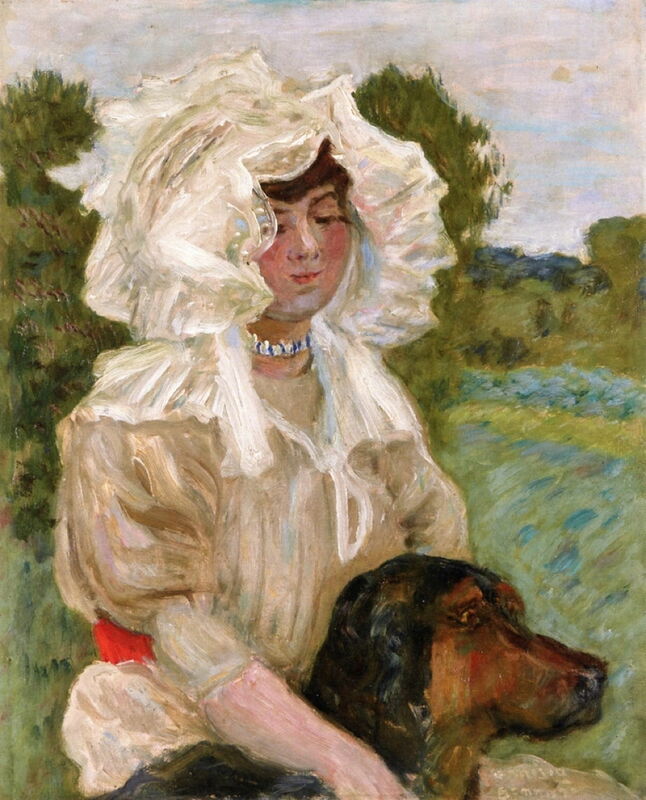 Misia, though, looks no happier in Renoir’s third portrait of Misia Sert with a Lap Dog (Young Woman with a Lap-Dog) from after her marriage, in about 1906. And the dog has changed to a toy breed, probably a Brussels Griffon. Bonnard continued to keep company with Misia and her husband. Maurice Ravel dedicated two of his most beautiful compositions to her: The Swan, from Histoires Naturelles, and The Waltz. Pierre Bonnard (1867-1947), Misia (1908), oil on canvas, 145 x 114 cm, Museo Nacional Thyssen-Bornemisza, Madrid, Spain. The Athenaeum. 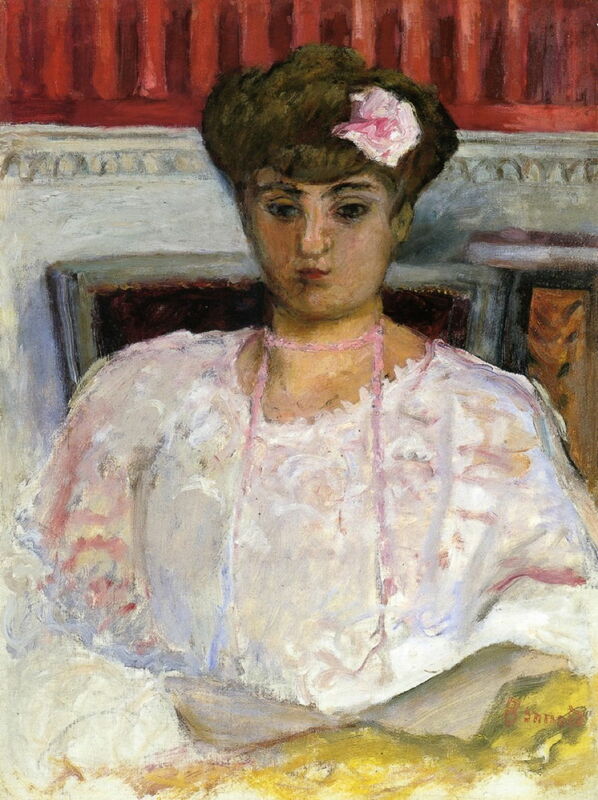 In 1908, Bonnard painted at least three portraits of Misia. Gone is the illusion of the shepherdess: she now sits in a lavishly-decorated room, with what appear to be Gobelin tapestries behind her. Pierre Bonnard (1867-1947), Misia with a Pink Corsage (c 1908), oil on canvas, 157.2 x 117.9 cm, Private collection. The Athenaeum. 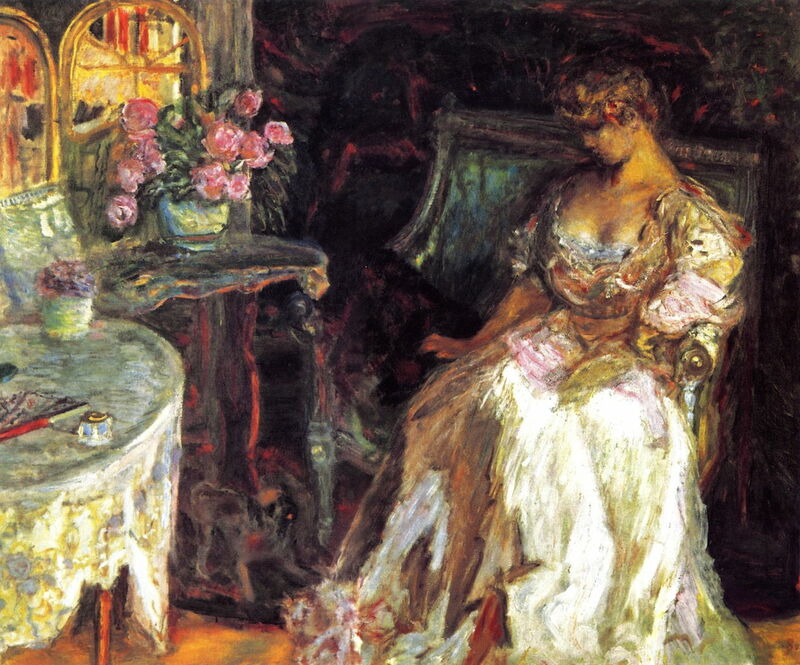 In Misia with a Pink Corsage, Bonnard closes in for a straight head-and-shoulders. Pierre Bonnard (1867-1947), Misia with Roses (1908), oil on cardboard, 114 x 146.5 cm, Private collection. The Athenaeum. In Misia with Roses, she looks down at an almost unseen pet she is stroking beside her. As could have been expected, Alfred Edwards proved unfaithful to Misia. She divorced him in 1909, by which time she was already in a relationship with the Spanish painter Josep Maria Sert (1874-1945). He had been on the periphery of the Nabis since he moved to Paris in 1899. 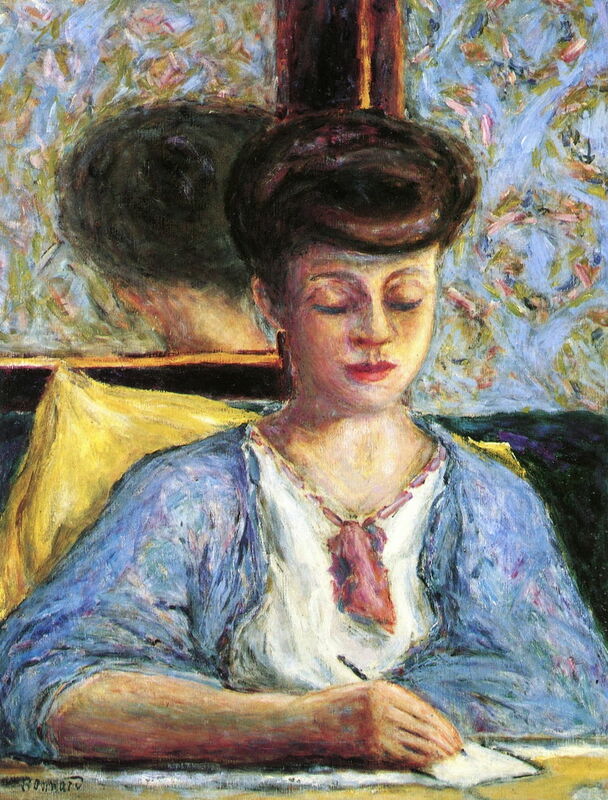 Pierre Bonnard (1867-1947), Misia Godebska Writing (c 1910), oil on canvas, 64.4 x 50 cm, Private collection. The Athenaeum. 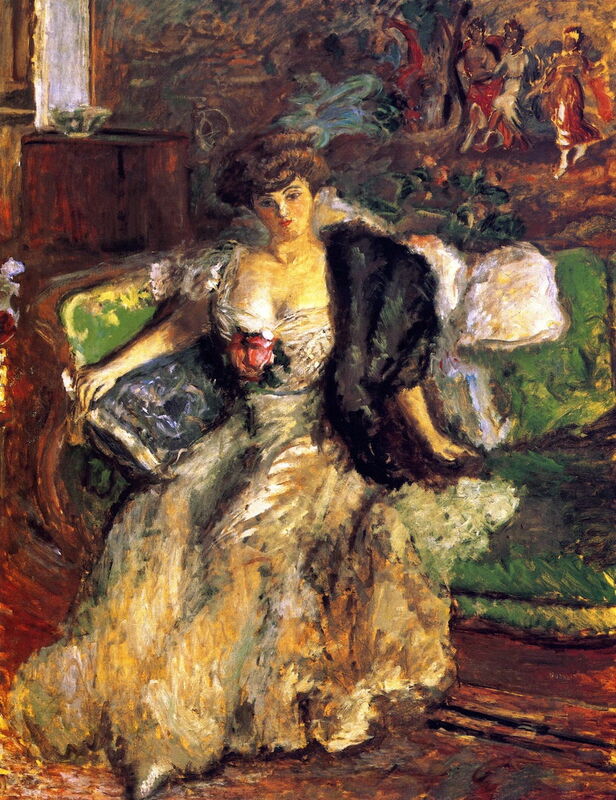 The last portrait that I can find by Bonnard, of Misia Godebska Writing, was painted in about 1910. It’s back to head-and-shoulders, although here the artist has used a little mirror play to reveal her chignon. Misia didn’t marry Sert until 1920, by which time she was established as the cultural arbiter in Paris, and a close friend of Coco Chanel. Her husband, a friend of Salvador Dalí, specialised in murals, and doesn’t appear to have painted her portrait. Instead, he spent over thirty years painting murals in the Vic Cathedral in Barcelona, and having affairs of his own. In 1927, Sert divorced Misia to marry the sculptor Isabelle Roussadana Mdivani (1906-1938), known for short as Roussy, who for a time had lived with the Serts in a ménage à trois. The Serts had been strong supporters of Sergei Diaghilev’s Ballets Russes, which was based in Paris from 1909. Josep Maria Sert painted sets and designed costumes from 1914 onwards, among other more famous artists including Pablo Picasso and Henri Matisse. Misia was heavily involved too, and often raised money to save a production from seemingly overwhelming debts. Misia remained close to Diaghilev, and in August 1929 she comforted him as he died in Venice of diabetes, then paid for his funeral from her own pocket. Just before the Second World War, Roussy Sert died, and Misia and Josep Maria Sert reconciled and sort of lived together, in separate apartments in Paris. Misia’s reputation remained unblemished during the Nazi occupation of Paris, and she died there on 15 October 1950, at the age of 78. Without Misia’s influence and support, a great deal of the painting, music, and ballet of the first half of the twentieth century simply wouldn’t have happened. Posted in General, Life, Painting and tagged Bonnard, Debussy, Diaghilev, painting, Ravel, Renoir, Sert, Toulouse-Lautrec, Vallotton, Vuillard. Bookmark the permalink.